SOCIB has participated in the Forum on Fisheries Science in the Mediterranean and the Black Sea (Fish Forum 2018), held at FAO Headquarters in Rome, 10-14 December 2018. Presentations from SOCIB included the Oceanographic Turtles as ocean monitoring platforms, operational fisheries oceanography and together with IEO and OGS, SOCIB convenered the workshop: Toward operational fisheries oceanography in the Mediterranean Sea. The Fish Forum 2018, the first event of its kind in the Mediterranean and Black Sea region, will encompass oceanographic, social science and economic perspectives on fisheries research. It will therefore review leading work that has been carried out, while also addressing the pillars for the development of fisheries science. 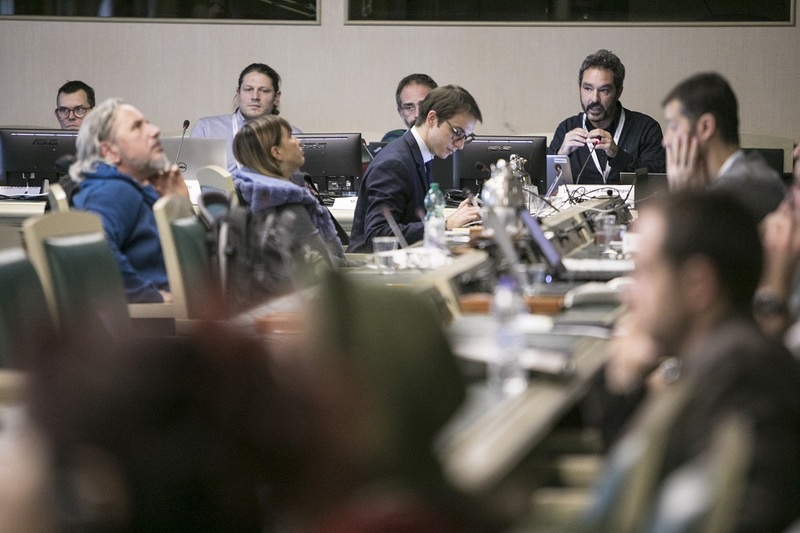 The overall goal of the forum is to bring together the wider community of people working on fisheries and the marine environment in the Mediterranean and Black Sea in order to bridge the information gap, discuss advancements in research, integrate scientific knowledge in support of decision-making and identify research priorities for the future. The workshop was divided in two sections. During the first section, focused on the integration of environmental variability into fisheries assessment, participants recognized this integration is still unresolved. Chairs presented the bluefin tuna project, a joint research initiative conducted by SOCIB and IEO in the Balearic Islands, as example of success study case. The group discussed how to apply same approaches to other study cases, recognizing the strong potential to improve fisheries assessment conducted in the framework of GFCM. Identify success study cases and promote new ones. Paralell session 3: Interactions between vulnerable species and human activities. Recent advances in biotelemetry and electronic monitoring systems allow investigating the use of space of marine animals with a high resolution. The combination of in situ observations, remote sensing and numerical models offers an unprecedented opportunity to investigate the interactions between environmental factors, marine animals and human activities. Oceanographic Turtles aims to provide the scientific basis to support the development of risk mitigation techniques based on new ocean observing and forecasting systems and contribute to the conservation of marine turtles. The project addresses the role of operational ecology in the dynamic ocean management using the loggerhead turtle (Caretta caretta) in the western Mediterranean Sea as case study. This work will focus on the assessment of potential interactions between fisheries and loggerhead turtles using AIS and satellite tracking. More specifically, we will present the most significant advances that have been developed in two main axes of the project: (i) Analysis of satellite trajectories in relation to environmental factors and human activities (i.e. through AIS data) using computational ecology methods. (ii) Design of operational tools for the management and conservation of sea turtles, aimed at both the reduction of bycatch and the optimization of the release of specimens from rescue centers. As a whole, the results of the project will provide a scientific basis for the development of risk mitigation techniques based on the new ocean observing and forecast systems. Operational fisheries oceanography is about the practical integration of environmental variability into the fisheries assessment and provision of advice. To achieve best practices in this new field we must link experts in fish ecology, fisheries assessment and operational oceanography. The practical scheme for its implementation have already success study cases, as the provision of the unique fisheries independent index of abundance of bluefin tuna in the Mediterranean, obtained by linking ichthyoplankton surveys with larval habitat modeling. Practical application schemes can be also applied demersal and small pelagic resources, and to use MPAs as reference levels of fish status in coastal areas. Finally, Diego Álvarez-Berastegui participated in the Plenary Session where Final conclusions and priorities for the coming decade were discussed. He presented a short summary of the workshop 5. The activities developed by SOCIB in the FishForum show results developed in the framework of various projects: the BLUEFIN TUNA project (funded by SOCIB and IEO), the European Union’s Horizon 2020 research and innovation program under the Grant Agreement No 773713 (PANDORA), the IMBER/CLIOTOP OOSTOP Task team (2016/04) and the TORTUGAS OCEANÓGRAFAS - Ayudas Fundación BBVA a equipos de investigación científica 2016.